Networking at Funerals is Wrong, Unless . . . 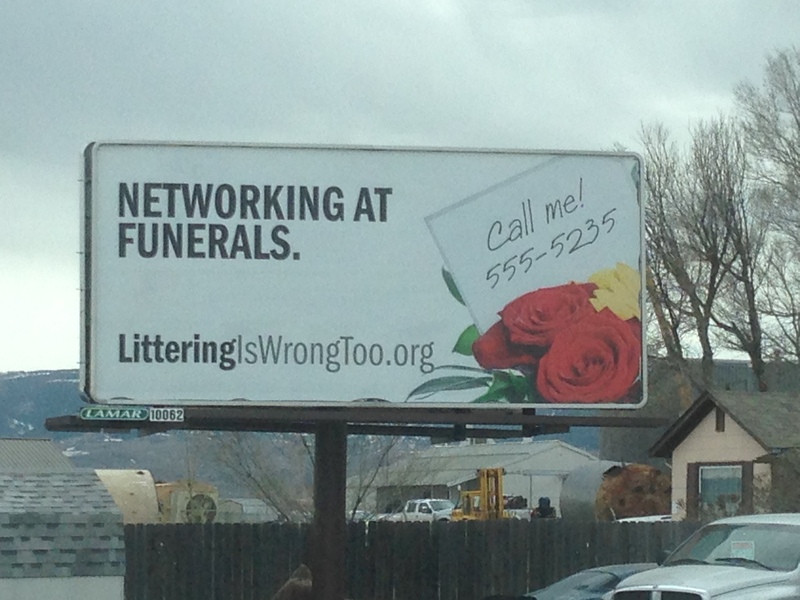 While driving through Casper, Wyoming, I saw this rather amusing sign about networking. I had never considered the question of networking at funerals, but I certainly agree with the sentiment expressed in the sign. You shouldn’t “network” at funerals. On the other hand, the biblical concept of networking that I have explained in The Kingdom Net: Learning to Network Like Jesus sees networking as the essential mechanism through which the Kingdom of God–God’s sovereign rule–spreads from person to person. It involves the establishment of relationships through which you can serve the needs of others effectively and with love. Why does anyone go to a funeral? I attend them to offer my sincere respect, affection, and help for the family of the person who has died. I usually see other friends there, and I offer and receive comfort from the renewal, and often, deepening of the relationship. If you see an opportunity to help someone at a funeral, the question “What would Jesus do?” has an obvious answer. He’d step in to help. In the highest and best sense of the word “networking”–the Jesus Way of Networking–funerals turn out to offer an excellent opportunity for Kingdom Networking that seeks to serve others and express God’s rule in every situation. Dr. Joseph Castleberry is President of Northwest University in Kirkland Washington. He is the author of The Kingdom Net: Learning to Network Like Jesus and Your Deepest Dream: Discovering God’s True Vision for Your Life . Follow him on Twitter at @DrCastleberry and at http://www.facebook.com/Joseph.Castleberry. Networking can create great excitement, and having lots of friends, colleagues, and connections offers many opportunities for fulfillment as we serve others and as others step up to help us in our needs and projects. Whether you have five friends or five thousand, the more the merrier. “Let the king have sixty queens, eighty concubines, young women without number! In the sphere of love, one connection can offer more value than a thousand, but the principle goes further. In all of our relationships, the one should usually outweigh the thousand. A common rule of courtesy demands that the person in front of you should feel like they are the most important person in the world to you at that moment. Maintaining real presence in every context you inhabit, giving your whole attention, making each person feel truly important–these basic social manners suffer real threats in a world of mobile phones, instant and constant internet, and multimedia. The clock ticks on, and the next appointment beckons. But when the person you do business with at any time feels they have your total attention, it can create powerful collaboration on any task. Attention to the one means that two can change the world. No sphere demonstrates this truth more than the duet of marriage and the circle of family life. Busy lives do present a challenge, and treating the one as more important than the thousand taxes our capacity at work as much as it does at home. I need to ratchet up my own attention to the Value of One and my commitment to presence. This very moment offers a great time to get on it. When you reach out to someone to start a relationship, they must accept your offer for a connection to take hold. Successful networking requires a two-way street. The easiest and most delightful networking often happens when two parties reach out simultaneously. Sometimes, even more people will get in on the act as multiple people decide that two people should meet. A two-way street is great, but sometimes networking can come together like the intersection of several roads. 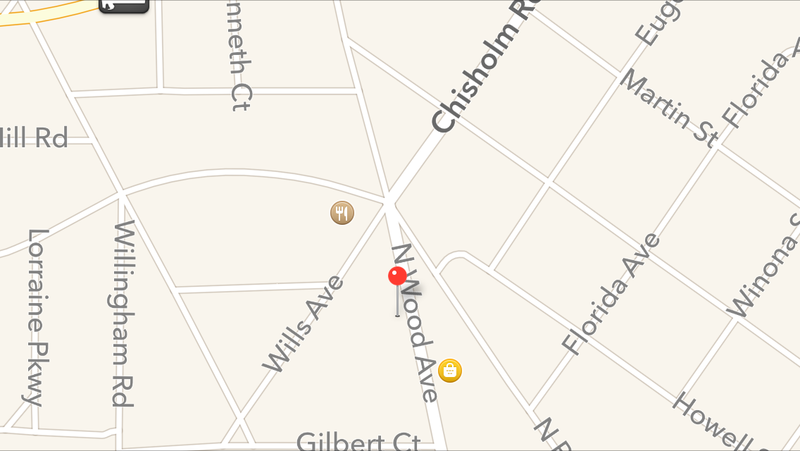 I fondly remember a place in my hometown, Florence, Alabama, where seven roads came together in one intersection. When many roads meet in one place, you can expect a lot of options to come together! Recently, a Seattle Christian radio station owned by Salem Communications, KGNW (820 AM) hosted a pastor’s luncheon and invited me to attend. I had a great time at the event and met several of the people at the station. I met Stan Lander, Senior Marketing Consultant, and he worked with my assistant, Anne Kuchera to book me for two interviews with Doug Bursch, who hosts the Live from Seattle program during the all-important afternoon drive time slot (4:00-6:00 P.M.) After those interviews, they also scheduled me for an interview on their Spanish-language sister station in. I totally like everybody at the station! Chuck Olmstead, the Director of Ministry Relations, is a real mensch! Stan Lander has become a genuine friend, along with his son, David. Doug Bursch, the host of Live from Seattle, who graduated from Assemblies of God Theological Seminary, where I used to serve as Academic Dean, does a fantastic job as host of the program, and his producer, Nick Shishkowski, bends over backwards to make things easy. I must not have done too badly as a guest on the show, so the station invited me to host the show while Doug took some vacation time. My schedule would only let me accept one day. 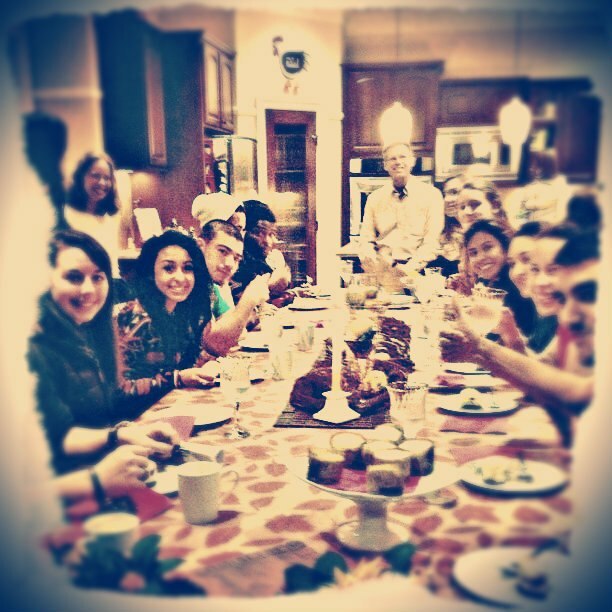 At the point where all the relationships converged, I got to host the show last Monday. I fell in love with radio! Here’s the audio from my program. It focuses on the Faith at Work Movement in Seattle. I hope you’ll enjoy it! For more ideas about networking, see The Kingdom Net: Learning to Network Like Jesus (My Healthy Church, 2013). Order it in paperback or Kindle edition at http://www.amazon.com/The-Kingdom-Net-Learning-ebook/dp/B00EDO1F6M/ref=sr_1_2?ie=UTF8&qid=1376544126&sr=8-2&keywords=Joseph+Castleberry. For more, see The Kingdom Net: Learning to Network Like Jesus (My Healthy Church, 2013). Pre-order it in paperback or Kindle editions at http://www.amazon.com/The-Kingdom-Net-Learning-ebook/dp/B00EDO1F6M/ref=sr_1_2?ie=UTF8&qid=1376544126&sr=8-2&keywords=Joseph+Castleberry. A couple of weeks ago I had a great interview about The Kingdom Net with Doug Bursch on Live From Seattle on KGNW 820 AM. If you have read the book, you may enjoy the additional insights that show up on the the radio interview; if you haven’t read the book, I hope you’ll enjoy the interview! Many people go out to network, not because of Kingdom priorities, but because they need a job! Most workers want to have an employer, but some don’t want to serve one, so it doesn’t take long for their relationship with an employer to sour. Pop culture music continually resounds with songs about bad bosses, and Marxism has had a long run (150+ years!) of wild popularity in haute couture circles, averring that the very act of paying people money in exchange their time and work constitutes evil exploitation. Sometimes employers do treat workers unfairly, even as some workers fail to appreciate their employers. In today’s climate of dramatic high unemployment in America (not to mention the rest of the world), I’d like to take a moment to honor employers. In most cases, employers take significant risks with their own money to put people to work. If they win, they may win big or small. If they lose, they can lose big. To everyone who ever put their money at risk and gave me a job, thank you! May you win big and retire well! Employing people carries intrinsic dignity, but the Bible confers another essential honor on employers in Genesis 2. Long before the Fall or the Curse, work made up an essential element of the Creation, and God honored all workers by becoming the very First Worker (Gen. 2:2). A few verses later, Genesis reveals that God was the First Employer. “The Lord God took the man and put him in the garden of Eden to work it and keep it” (Genesis 2:15, ESV). Employing people is a godly thing to do. The honor of employers is to follow in God’s example as the First Employer; their glory is to treat their workers with the same love, grace, and justice God’s workers enjoy. Hooray for employers! May they carry their risks and responsibilities with God’s own integrity.